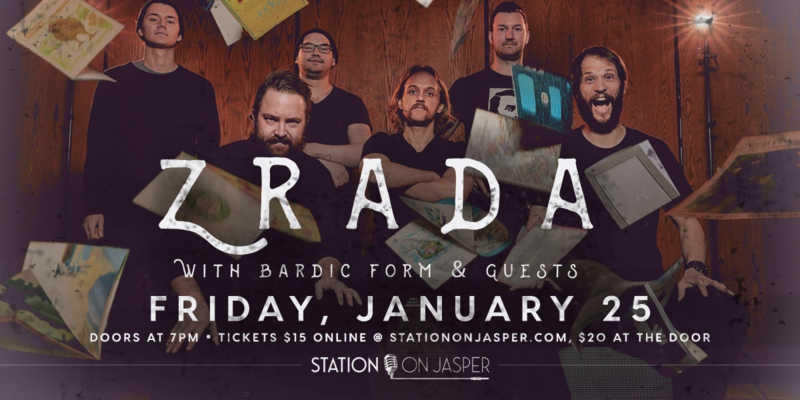 A folk-punk tour-de-force, their subversion of Eastern-European musical traditions, enigmatic imagery and raucous live shows are pushing Zrada to craft some of the most forward-thinking and captivating world music in Canada today. With its base in Winnipeg, Zrada has been experimenting with the soundscapes of their ancestral Ukraine for over a decade. Striking vocal harmonies, powerful trumpet and violin melodies combine with jazz infused rhythms to create a wild and joyous dance floor experience. We couldn't think of a better group to open for Zrada than bardic Form. With their celtic-inspired music, you feel like you are in a medieval tavern. Station On Jasper presents a fantastic night of great music and good vibes. Doors at 7pm, but come in early for some food and drinks.